Have your teeth been worn down from years of grinding, clenching, TMJ or simply lack of proper dental hygiene? Don’t worry. You’re not alone. There are millions of people out there with collapsed bites due from “wear and tear” and flattened teeth. The bad news? Your teeth and smile are not living up to their full potential. The good news? Worn and flattened teeth can easily be restored. One way to restore worn or flattened teeth is to treat yourself to porcelain veneers. With porcelain, loss of tooth enamel from acid erosion can be swiftly repaired. Smooth and glazed porcelain feels exactly like healthy, clean enamel. The veneers ensure strong teeth, which means no issues whatsoever with chewing. At Sugar Fix Dental Loft, we want your smile to look the best it can, but not at the cost of functionality. We want you to be able to chew seamlessly while at the same time show off a movie star smile. If you grind your teeth, porcelain veneers allow your jaw to realign naturally. 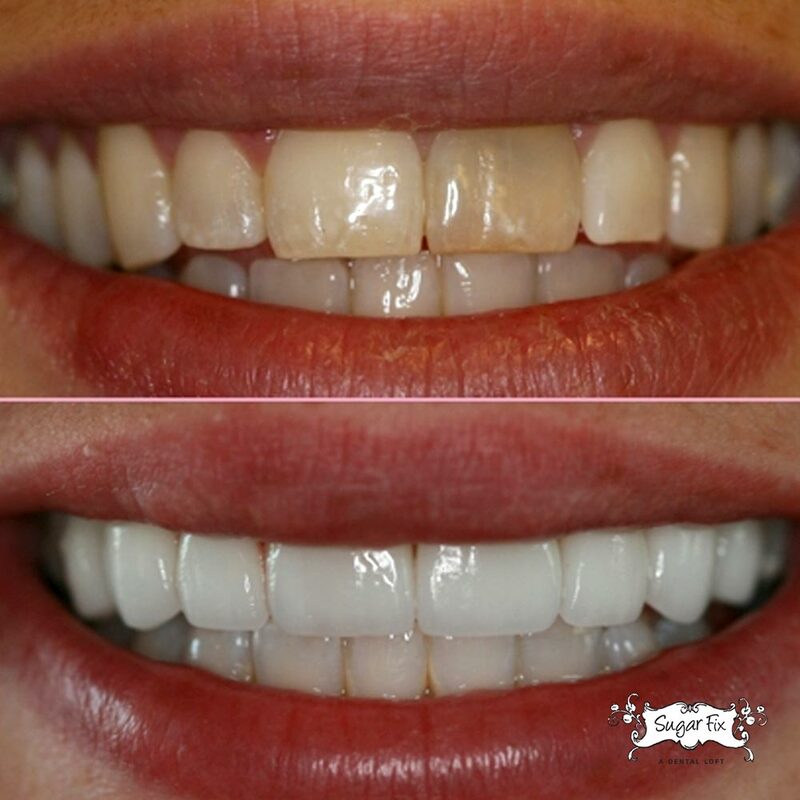 It sounds crazy, we know, but veneers can completely transform your whole face; not only your smile. Your face will lengthen and your lips will be properly supported; thus improving your overall bite. The best part of veneers is that the treatment is totally non-invasive. Veneers are customized ceramics sheaths that bond to your tooth’s original surface (the surface you’re trying to fix). Any and all flaws of a misaligned bite will be banished forever. Porcelain veneers help treat misalignment issues and worn down, flattened teeth. That we know for sure. However, you may also use veneers to fix chipped, cracked or broken front teeth. Or maybe you have short teeth to begin with. It’s all you’ve ever known. Could be genetic, no? Teeth that appear to be a tad too short can easily grow a little taller with the placement of some polished porcelain. Teeth too sharp or pointy? We got you. Porcelain veneers dull the sharpness and round out the pointy ends. Call us today at (773) 883-1818 to learn how porcelain veneers can find your proper bite and build it back. If you believe you have occlusion (correct alignment of teeth) then good for you! You’re all set. Hit the road, Jack. But if you have a conditioned called malocclusion, you want to get that taken care of ASAP. A deviation from proper occlusion can cause you to bite the inside of your cheeks and tongue. Enough blood has been shed, people. We want your bite to help you break down food to fuel your body. A bite that take a bite out of your cheek or tongue has got to go, you guys.